arnival Mania is the the product of a merger between two active members of the UK soca / carnival scene. Vinny Ranks and Dwayne Huggins. Collectively they have over 25 years experience in carnivals, soca and fetes. inny Ranks, an internationally known DJ and MC. He has been DJing / MCing for over 20 years. His most recent project is Bakahnal Radio an online radio station which has a global audience. Vinny has been involved in some of the most successful mas bands in the UK, Cocoyea and Chocolate Nation. Both bands benefitted greatly from his vibe, work ethic and industry relationships. Vinny had wanted to have a mas band of his own for a while and reached out to Dwayne to see if they could create one together. wayne Huggins is a British born Trini. He’s a soca loving, carnivalholic who has been on the UK soca scene for over 20 years as a feter. 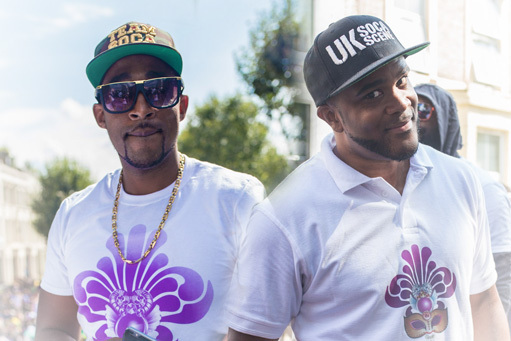 In 2011 Dwayne started UK Soca Scene which is a popular online channel for all things soca related in the UK, Europe and beyond. Alongside his other projects (Live Love Soca, Ibiza Soca Festival and Jambolassie) Dwayne decide that in 2016 the time was right to start a mas band. A discussion with Vinny happened and the rest is history. We are a fresh and vibrant band, bringing a completely different vibe to Notting Hill Karnival. 2019 will be our forth year on the road. Although we are still a newish mas band, we have years of carnival and cultural knowledge to ensure the perfect experience on the road.